Daniel Van Gerpen has been surrounded by agricultural landscapes his entire life. He grew up in the Midwest surrounded by corn and bean fields. The rows vibrated in his periphery as he endeavored on many a drive through the country. When he moved to California as a young adult he found the fertile fields of the Salinas Valley a source of artistic inspiration. It was not until his migration to the Central Valley, in the throes of a drought, did his interest turn to the relationship between the fields and their water sources. Van Gerpen is often asked where each piece comes from. His typical response is that while pieces are often inspired by actual places, they are edited and simplified in an attempt to capture the feeling of a place. While many images are familiar they are often not a place you can actually go to. He pulls inspiration from photographs and merges ideas into sketches before putting brush to canvas. The sketching process allows him to work through many ideas, compositions, and changes in a more efficient matter and allows him to combine many scenes into one. Often color studies are also prepared before beginning a new piece. Even with all this preparation, the painting remains organic until the very end. Things can change in process and many paintings consist of several layers. This process adds to the texture of the final piece and is an integral part of the process. Much of his inspiration comes from areas surrounding the San Joaquin and Kings Rivers, as well as the canals that transport water to various locations. While there are no figures in his work the human influence is quite present. The rows and roads bisect the compositions as gridded fields take shape on the canvas and shimmering rivers cut a cool wavy line through the verdant and sometimes arid landscape. Van Gerpen explores this theme through a mixture of media. He creates, oil paintings, mixed media work, and even a sculpture to convey the different moods of the landscape. He represents the lines, shapes, light, and colors of the valley in a tactile way that reminds the viewer of the place they live in. I have been depicting agricultural landscapes for decades. 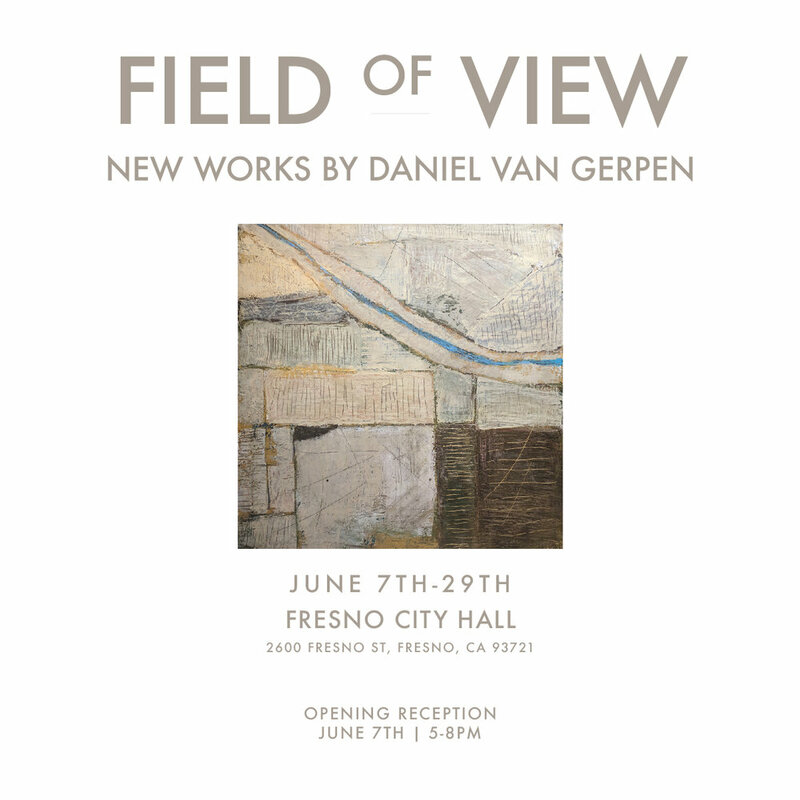 With this new collection, “Field of View”, I take on a new perspective. This series of aerial landscapes explores the juxtaposition of agricultural fields and the winding river that bisects it. This duality of straight rows and winding river celebrates the rhythm of the agrarian landscape. This representation of verdant fields, azure river, dark alluvium, and golden light celebrate the vibrant vistas of the valley. “Field of View” will be on display at the Pacific Grove Art Center from March 2nd through April 26th with an artist reception on Friday, March 2nd from 7-9pm. The Pacific Grove Art Center is located at 568 Lighthouse Avenue Pacific Grove, CA 93950. For more info visit www.dvgcreative.com orwww.pgartcenter.org. I was honored to receive "Best in Show" for my aerial landscape of the Central Valley during this years "Arts Alive in Agriculture", hosted by the Fresno Arts Council at the Fresno City Hall. Many talented local artists were included in this annual fine art exhibition, held each year, displaying the beauty of agriculture in the San Joaquin River Valley and surrounding area. I look forward to being a part of Third Thursday Arthop in Fresno. I have 35 pieces on display at Green Office Furnishings in Fresno. Join us on Thursday, June 16th from 5-8pm for Arthop! I was honored to receive first place in the landscape division of the Arts Alive in Agriculture show. The show is on display during April at the Fresno City Hall lobby. During the month of October I am taking on a 30/30 challenge. Last November I worked through a postcard challenge by creating a postcard sized painting everyday. This year I am stepping it up a bit and plan to create 30 paintings in 30 days. I am hoping to develop my painting style and experimenting with different styles and techniques. I hope this is a time of growth and look forward to seeing what develops. I will post the paintings as they develop along with behind the scenes images to help show my processes. You are invited to follow along with the process over on my Instagram page. I was honored to have two of my pieces receive third place ribbons at the ACA September Invitational Show at Chris Sorensen Studios. A few images from the gallery display at the Pacific Grove Art Center in May and June. I am looking forward to my upcoming exhibition entitled: Remnants and Relics at the Pacific Grove Art Center in Pacific Grove, CA May 1 through June 25th. An opening reception will be held on Friday, May 1 from 7-9pm. Marked by myriad of media such as painting, photography and assemblage the integrated vision of this collection combines the idea of remnants and relics with a passionate interest in light and time. My process involves layers of memories conveyed through layers of paint enhanced by found objects reminiscent of the portrayed places. These excavated artifacts share in the storytelling. I intend to not just recall a place, but also provoke a feeling. I seek to add texture to help draw forth the atmosphere of an experience and incorporate found objects to connect the tactile with the visual. Here is a time-lapse video of me in the studio working on a new piece. I am halfway through the daily post card challenge. It's been fun creating a little something everyday even if it is something simple.